Take a look at this visually dynamic way to get your students excited about poetry. No, really. View this 27-slide Prezi and imagine all of the possibilities that your students could create. All you’ll need to fill an entire class session is this Prezi (you don’t need any special equipment or software to use Prezi – if your computer can view a YouTube video, then you can enjoy a Prezi), dark markers, and a few newspaper pages or photocopies of a few pages from any novel you’re currently teaching. A dazzling alternative to Powerpoint, Prezi allows presenters to “zoom” to their next slide and the modern design captivates a teen audience. Students love the Prezi style and beg me all the time to make more of them. You can also check out Prezi for free at www.prezi.com. Prezis run on both SMARTBoards and regular classroom computers with projectors. Note: Due to the “zoom” animations, this zip file is large. If you download it from here, the process will take a few minutes, so please be patient. When you get the folder, open it and launch the “Prezi.” Just ignore the other items; they’re needed to run the show. Your computer will ask if you want to “open” the web-created file. No worries; there’s no virus, so just open and enjoy. For full-screen viewing, be sure to click on the small icon in the lower right-hand corner (just like on YouTube). This product includes detailed steps for students to follow and inspiring examples from: Harry Potter by J.K. Rowling; Paper Towns by John Green; The Lovely Bones by Alice Sebold; The Great Gatsby by F. Scott Fitzgerald. Age-appropriate for every audience. I hope you enjoy this fresh approach to lecturing that’s sure to keep your students’ attention. If you like this product, please leave me some feedback. I look forward to hearing from you! This item is part of my full, 4-week poetry unit. Click HERE to check out my money-saving poetry lesson bundle. 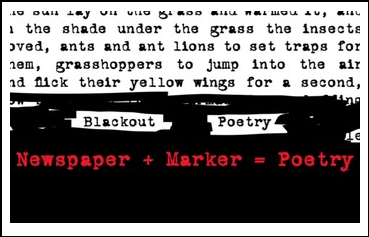 Keywords: poems; writing; inspire; blackout poetry; media; magazine; novel study; inspire; fun; easy; free; freebie; Prezi; SMARTBoard; Powerpoint.